Yes it's that time of the month again friends: time to dust of our aprons, sharpen our knives and get daring. Daring with a capital "D" that is! Truth be told the concept of enchiladas wasn't all that daring to me, as I've ventured down that road before. However the real challenge was making your own Mexican style sauce to use in the enchiladas and this was definitely worth the effort. I ended up butchering this challenge (out of necessity) to adapt to what I could procure locally and tomatillos, unfortunately, was not one of those things. Neither was corn tortillas. Corn tortilla chips I could find by the truckload but a plain tortilla? No dice. I bravely attempted to fashion my own corn tortillas using maize flour - I figured, it couldn't be too different from the masa harina normally used to make this. Wrong. Wrong wrong wrong wrong wrong. Don't even attempt this. Unless you want to end up with a mushy, white bowl of flour sludge. Not an appetising thought. In the end I decided to abandon the stacked enchilada concept as advocated by the sample recipe in favour of the more traditional rolled enchiladas. For which I could use the easily obtainable flour tortillas. The tomatillos was substituted by green (i.e unripe) tomatoes with added lemon juice, as suggested by our resident Daring Kitchen expert, Audax. And that was it folks. After overcoming these obstacles the recipe came together easily and relatively quickly. I was a bit apprehensive regarding the large (to me) quantity of chillies, but even though chili sauce was fiery on it's own, it was spicy perfection in combination with the chicken and tortillas. Which just proves again - homemade is always superior. Thanks Barbara & Bunnee for an awesome challenge! 1. Place chillies, tomatoes and garlic on a oven tray. Broil for 10 - 15 minutes or until tomatoes are softened and chillies blackened. 2. Peel skins off chillies, slit open and remove seeds. Add chillies to a blender along with tomatoes and puree. 3. Removed pureed tomato-chili mixture to a saucepan and squeeze the roasted garlic into the sauce. Add oregano, salt, pepper and chicken broth, mix through and bring to a boil. Reduce heat and allow to simmer for 10 minutes. 4. Add the cornstarch/water mixture and stir well. Simmer, stirring occasionally, until the sauce is thickened and reduced to 4-5 cups (this will take approximately 10 - 15 minutes). 5. Taste, adjusting seasonings if needed. Set aside. 6. Preheat oven to 180C. Mix together the chicken, squash and half of the cheese for the filling, lightly seasoning with salt and pepper to taste. 7. Spoon half of the sauce into the bottom of a rectangular ovenproof dish, large enough to hold all the enchiladas. 8. Cut tortillas in half, then add a large spoonful of filling to each half, and lightly roll up. Tightly pack into the ovenproof dish, atop the sauce. 9. Spoon over the remainder of the sauce and place enchiladas in the oven for 15 minutes. Remove briefly, topping with the remainder of the cheese, then return to the oven for another 5 minutes or until cheese is melted and bubbling. Garnish with chopped coriander (cilantro) and serve while still hot. It really is a crowd pleaser Juno! Let me know how it turns out for you. I love enchiladas, and wish that corn tortillas were available (I may however be able to wangle as my neighbour owns Mexicorn). Looks yummy! Pity the maize flour didn't work for the tortillas - how frustrating, because it feels like it ought to work! I make my own flour tortillas but have never gone out looking for the right flour for corn ones. Let me know if you find something that works. This looks like one delicious batch of enchiladas. I would not dare to try making my own tortillas so I'm impressed that you even gave it a try! The sauce - perfect. Wow! I would have never thought to use summer squash (which I love) in an enchilada. It looks amazing. Your Enchiladas looks delicious. Your photos are great. Everything on your site is so colourful. Sam - Let me know if your corn tortilla quest pays off! Kit - It is very frustrating yes, but I'm guessing the masa harina is a very specialised type of flour. Will let you know if I manage to find a substitution. Valerie - Audax is such a mine of information isn't he? Love that guy. Oh my husband would love me extra if I made these for him. They look wonderful. oh dear.. 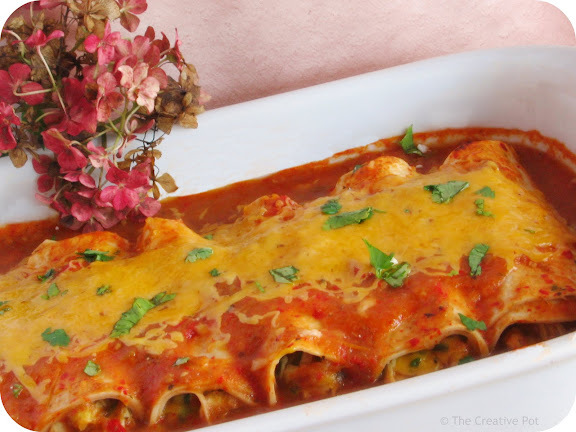 I don't know how I missed this, but these enchiladas look so good, I don't know what to do? Can I move in with you and TheHusband? I want to be cooked for too! !